Rodellar (Spain). Last Sunday the World Climbing Day has been held in the presence of the Holy Father on the large esplanada, just below the Gran Boveda sector, in Rodellar. Thousands of climbers from all over the world had come for this day of sport and prayer. During his homily Pope Francis drew the attention of the faithful regarding the need to help the weak by quoting St. Paul and his Letter to the Romans (Rm 15,1): Now we who are strong ought to bear the weaknesses of those without strength and not just please ourselves. Francis explained that St. Paul was referring to the suffering of man in general, but added, «What else is suffering than getting just below the anchor chain completely pumped after a 35 meters climb and then falling down?». The Pope, speaking about his encyclical De pietate arrampicatoris (The climber’s mercy), urged all of climbers present to respect the most vulnerable: «When we go climbing with someone weaker than us, we have to consider his needs and not just take him along in order to split the cost of gasoline. We cannot expect – continued the Pope – everyone to warm up on those 7a’s that the strong climbers know by heart. 7a is still a difficult grade for the weak. Always remember that!». He then continued: «If the weak one is pumped or fails to make the move, let him try and do not give him the impression that you want to lower him down just because it is a good grip and you have to try your project». Moral precepts which the thousands of young and old climbers have appreciated and assimilated. After the Mass, the Holy Father, as a gesture of mercy, washed the feet of Dani Andrada and Patxi Usobiaga in the waters of Rio Mascun, the river flowing in the Rodellar valley. The two champions, visibly excited, chose however, as a sign of respect for the Pope, to wear their climbing shoes, so as not to show their lumpy feet. At the end of the ceremony, The Pope announced that the canonization process of Wolfgang Gullich has started, at the Congregation for the Causes of Saints: «Making the first dyno and holding the second monodoigt of Action Direct in 1991 was a miracle, a clear evidence of Divine will». 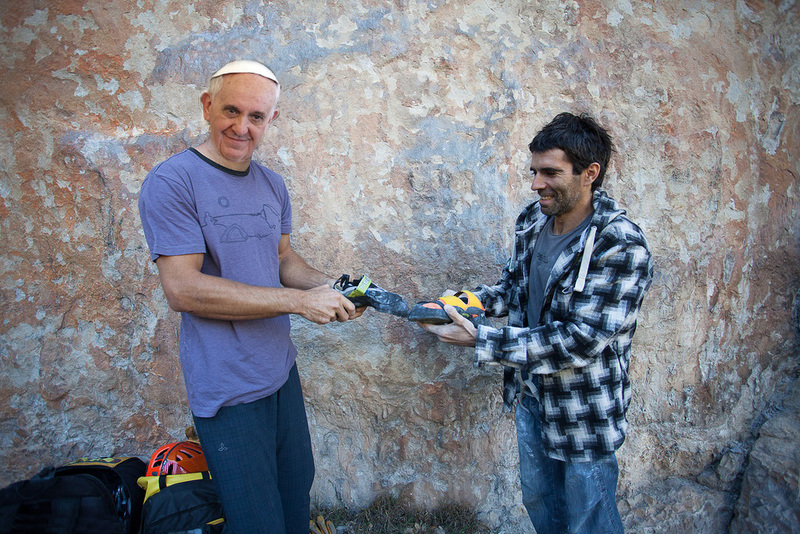 The Holy Father then wanted to spend some private moments of freedom and went to the Gran Boveda to climb some routes, accompanied by Dani Andrada. To everyone’s surprise, well guided thanks to the common language by the excellent and patient Dani, who was belaying and explaining the moves from below, Francis flashed Coliseum, 8a. Papa Francesco testing shoes with Dani Andrada. Boreal or Evolve? Mystery of faith…. 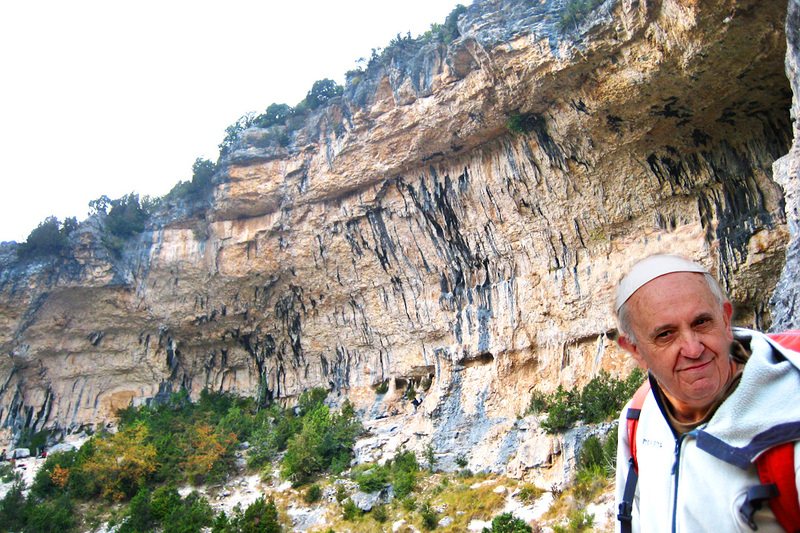 He climbed without major problems: after the first section of pure endurance, reaching the knee-bar, where there is a total rest, Francis joined his hands and gathered in prayer for few minutes. After the big rest, the Pope climbed smoothly the last few meters of the route up to the top chain, though some of those present would have heard him screaming puta puta at the last hard move. While we’re not in position to confirm this rumor, our thoughts turn to one of his recent posts on Twitter, where Francis says that we are all sinners. During the return trip on the papal plane, hobnobbing with reporters, the Holy Father, when questioned about the results of this important pastoral mission, laconically sentenced «Coliseum? Mr. Zanchetta, it’s no more than 7c».